Wm WM Rose & Sons Ltd are proud to be one of the UK`s most established suppliers of new and used Agricultural, Construction & Industrial equipment within Scotland and throughout the UK. We supply quality products from world leading manufacturers and brands such as Manitou, Gehl, Komatsu, Multisweep, Case IH & Polaris. Our new and used equipment includes a range of telehandlers, tractors, mini diggers, excavators, forklift trucks, telescopic handlers and loaders to name but a few. 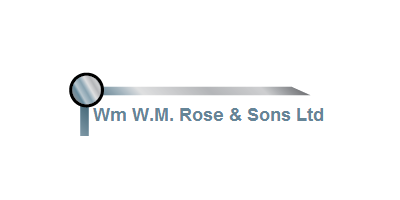 Established over 50 years ago, Wm W M Rose & Sons Ltd is a growing material handling and plant sales equipment company that owes its continued success to ongoing commitment and service to our customers, employees and associates. To continue our growth our aim is to provide a comprehensive range of quality service, consultancy services and plant training at competitive rates, accessible with just one phone call. We recognize that our standards must be maintained to the highest level to ensure that we provide the greatest care and attention to our clients.